(SitNews) Ketchikan, Alaska - Many people know that Roy Jones brought the first airplane to Ketchikan in 1922 and that he briefly operated Alaska's first commercial aviation company with his single plane, the "Northbird." After Jones wrecked his flying boat crash landing on Heckman Lake in 1923, it would be two years before another plane arrived in Ketchikan. This one would be piloted by Russel Merrill, a pioneering Anchorage bush pilot who would be credited with helping establish air transporation in Anchorage before disappearing on a flight to Bethel in 1929. Merrill Field in Anchorage would be named after him. Russel Merrill and the Curtiss Flying Boat in Portland prepping for the flight to Alaska. Russel Hyde Merrill was born in Iowa in 1894. His family was well to do and he eventually attended Cornell University. World War I interrupted his college studies and he enlisted in the Navy, eventually joining the new Naval Aviation Service. He became a Naval aviator in March of 1918, specializing in float planes and flying boats. He served as a training pilot and also flew survelliance missions off New York, unsuccessfully bombing a German U-Boat off Cape May at one point, according to "Flying Cold: The Adventures of Russel Merrill, Pioneer Alaskan Aviator," a book written by his son Robert Merrill MacLean in 1994. Merrill didn't end up going to Europe before the end of the war. Retiring from active duty in December of 1918, he returned to Iowa, and eventually finished his studies at Cornell. Smitten with the flying life, he wanted to begin his own aviation business, but opportunities were few in those days so he took his chemical engineering degree and went to work for the Crown Williamette Paper Company in Camas, Washington. He would work in the region for the next several years, but continued to fly with the Naval Reserve in California. In 1925, he saw an advertisement for a flying boat for sale in Portland. The plane was owned by pioneer Northwest flyer Roy Davis, who had a Ketchikan connection. Davis' father Arthur, was construction manager at the New England Fish Company facility in Ketchikan. Davis had been inspired by the exploits of Roy Jones and was interested in flying in Alaska. He had spent several years in Ketchikan when he was younger, according to Robert Stevens in Volume One of his comprehensive "Alaska Aviation History." After talking, Davis and Merrill decided to start a flying business in Alaska. Merrill's wife, Thyra, and their two young sons would eventually join them in Alaska. 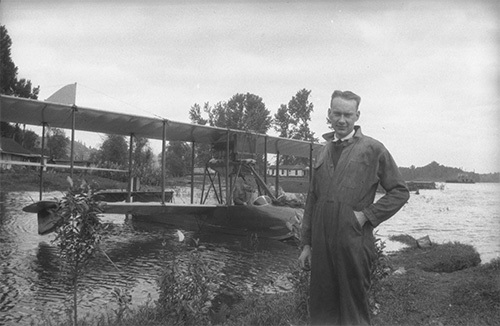 Merrill, Davis and mechanic Cyril Kruger flew from Portland to Seattle on May 18, 1925. On the 19th, they left for Alaska, with stops in Nanaimo, Sayward and Alert Bay, where they had to set down because the engine on the Curtiss F-boat was leaking oil. Next up were stops at Bella Bella and Prince Rupert. "From Prince Rupert flying in the dark, they crossed the Alaska line in fog and rain... at midnight they set down for a few hours rest in the little flying boat as it nestled in a cove like a storm petrel," Robert Merrill wrote in "Flying Cold. "Miserably cramped in the cockpit they were happy to take off at sunrise. At 5:30 am, May 26, the motor began to cough again and they realized they were out of fuel again. They put down just south of Tongass Narrows and were towed behind a barge into Ketchikan. They had made it to Alaska." Although they arrived in the First City without fanfare, word soon spread through town that the "airplane" had returned. "When Ketchikan awoke May 26, 1925, to find a near duplicate of "Northbird" moored on the waterfront, it quickly became clear that the airplane's absence for almost two years only made Ketchikan's heart grow fonder," Robert Merrill wrote. "The townspeople thronged to welcome the fliers and offer their services. A float was assigned to them free of charge. Soon the aviators had more requests for flights than they could accommodate." Originally, Merrilll had planned to only spend a couple of days in the First City, but the visit would last several weeks. It quickly became clear that there was a plenty of work to keep them busy and replenish their coffers. Merrill and Davis had originally planned to spend some time in Wrangell, servicing the cross border Cassiar mining district up the Stikine, but they ran into problems getting the required work permits from the Canadian government before they left Portland, according to Stevens. In Ketchikan, Merrill was initially hired to make aerial photographs of the town. Then several prospectors hired him for additional aerial surveys and transportation to remote sites. He also made numerous barnstorming flights with dozens of local passengers. It was during one of those that he came upon an idea that continues to provide work for area pilots nearly a century later. "From the air he could see the size and direction of a fish run and direct boats to intercept it," Robert Merrill wrote. "Merrill was hired to spot salmon runs for a Ketchikan cannery, saving the cannery time and increasing its catches." Merrill contacted his wife in Portland and she immediately came north with their two children. The family rented a small house near the harbor. "Much more social than her husband, Thyra enjoyed spending her days poking into odd corners of curio stores and wandering about the steeply graded streets of Ketchikan," Robert Merrill wrote of his mother. Word quickly spread to other communities and soon offers of work were piling in from Wrangell, Juneau and Petersburg, On July 1, Merrill flew to Petersburg, becoming the first pilot to land in that community. He spent a couple of days running supplies back and forth to the Blind Slough Power Project 15 miles from town. By July 4, he was back in Ketchikan, providing holiday entertainment for the community. The plane was kept so busy that its engine cam shaft wore out, convincing Merrill than a complete overhaul was necessary, grounding the plane for the next two weeks. On July 16, he took it out for test flight. At 600 feet above the harbor the plane went into a spin. "Merrill was calm and detatched as he worked the wheel, pedals and throttle, trying to regain control," Robert Merrill wrote in 1994. "But he has previously said it would be almost impossible to bring the flying boat out of a spin. His single matter-of-fact thought as the plane spun downward was 'well there goes another good aviator.' "
Fortunately, Merrill was wrong. He managed to arrest the spin 50 feet above the water and land safely. "He did not say what caused the spin but people watching the flight were thrilled," Robert Merrill wrote. "They thought he was doing aerobatics for their entertainment." Toward the end of July, Merrill and his wife Thyra decided to continue the coastal trip to Wrangell, Petersburg and Juneau. Heading north, the Merrills first had to taxi on the water for a couple of hours because there wasn't enough of a breeze to get airborne. Then when they got going again, they had to land in Clarence Strait to fix another oil leak. Finally, they arrived in Wrangell. Merrill planned several more barnstorming trips for residents but had trouble getting airborne because of the amount of wood debris in the water. "A small lumber mill operated on Wrangell's waterfront, and Russel found it difficult to avoid the surface debris each time he taxied out from the float," Robert Merrill wrote. "During the second day there, he felt a minor jolt and heard a a ripping sound as he was taking off. A piece of shingle had struck the tail assembly. That ended the flying for the day." The repairs allowed Thyra Merrill help get the plane flying again. "They worked all night," Robert Merrill wrote. "In the absence of cotton or linen, Thyra resorted to buying muslin. While Russel prepared the horizontal stabilizer and rudder frames for re-covering, his wife washed and dried the cloth to shrink it. It was painstaking work to fit the cloth to the frame by lamplight and sew it absolutely smooth and right. Next came the job of applying the dope, a pigmented filler and laquer that protects the cotton skin of stick and wire airplanes and makes it tight as a drum - coat after coat at half hour intervals for drying...by 11 am, the tail was ready for reassembly...the Merrills were back in business." Flying on to Petersburg, they went inland up the Stikine River to Telegraph Creek, then over the Baird and Patterson glaciers to Petersburg, where they did more barnstorming and made a flight close to Devil's Thumb. After flying to Juneau, they soared over the Mendenhall Glacier and the Alaska Juneau Mine. They did some more barnstorming and met up with Juneau's infamous "Taku winds." "Russel had heard of the destructive winds that occasionally rise without warning on the glacier and sweep down on the town with destructive force, " Robert Merrill wrote. "According to Native lore, the (Taku) winds were the breaths of evil spirits." The "evil spirits" caught up with Merrill as he was flying two young girls over the harbor. "A Taku swooped down with startling force," Robert Merrill wrote. "It was impossible to land in the immediate vicinity, the hull would have been smashed against the water. Unable to gain altitude, Russel flew around at an altitude of 50 feet, looking for relief from the downblast. The long dump from the (AJ) mine offered some protection, and he finally set down on the water on its lee side, fuel tank bone dry. The girls were not in the least frightened; indeed, they said they were thrilled by the adventure." On Aug 1, Merrill and Davis took the flying boat across the Gulf of Alaska from Juneau to Seward. This was the second cross gulf flight ever and the first to be done by a civilian flying boat. They continued on to Kodiak before deciding to return to Anchorage. On the way to Anchorage, Merrill was forced, on Sept. 5, 1925. to crash land on East Chugach Island south of Seldovia. It was the end of the road for the Curtiss Flying Boat. Merrill would go on to help pioneer air service in Anchorage and throughout Interior Alaska flying virtually everywhere from the Aleutians to Barrow. He survived dozens of crashes and forced landings, often having to survive days and weeks in the wilderness, walking out from remote crash sites. Merrill became famous for wandering out of the woods weeks after he had gone missing several different times. Finally on September 16, 1929 his luck ran out. On a routine three hour supply trip from Anchorage to Bethel, Merrill and his plane disappeared before reaching Sleetmute. A large storm came into Cook Inlet that night. Natives reported seeing a plane floating in the inlet near Tyonek, but the only part ever recovered in the weeks long search that covered 10,000 square miles was a piece of fabric that likely came from Merrill's horizontal stabilizer. The next year the Anchorage Municipal Airport was renamed Merrill Field.